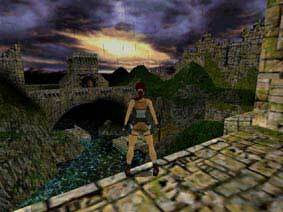 Tomb Raider III - The Lost Artifact on a Mac ? Before this expansion came out for the Mac, the only way to play it was to haxx0r a pc version of the expansion. Here are my observations on the rather peculiar experience that ensued. Ok..well, I followed Jamaica's instructions, and this is what I came up with. The game works amazingly well, actually, if you don't mind all the wierd sounds. When Lara fell and broke her neck, to me it sounded like she'd fallen in the water, and when you drop into the water it sounds like you're hitting the ground. Her voice also seems to have dropped an octave or two in some instances, like when she pulled a lever. Most of her walking sounds were still fine, as were her gun sounds. Most of the animal sounds were alright as well, although so far that's really only been tested with the crows. The music worked perfectly, although it does still sound as if you are in India. The 'event' music (such as when something scary is about to happen, etc) was still perfectly in place, so the sound doesn't completele spoil the whole thing. You can turn the sound off, but it's rather unnerving not being able to hear when the bad guys are nears you, even if they sound more like baboons than guys in uniforms in this case. 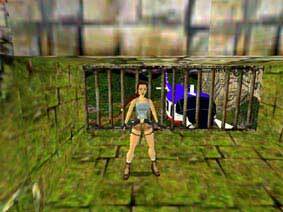 I would recommend keeping a spare version of the JUNGLE.TR2 file around, just to save you reinstalling the entire game when you wanted to revert to the proper levels. 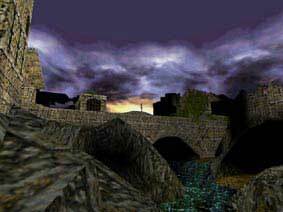 I haven't reached the end of the level yet, so I have no idea what will happen there, but to my great surprise there was absolutely no problem saving or loading games in the level whatsoever - no crashes or anything ! Until further updates, enjoy the screenshots from my mac, and look forward to hopefully having some Peculiar Screenshots from this little experiment. Keep an eye on the news for more details.